I found this frozen beauty a few years back when I was just beginning my quest for rural decay. It is or was located on a narrow farm road in Northern Iowa. Most of it at the time was still standing with the exception of the front room and part of the kitchen. The front room had fallen completely to the ground and somewhat blocked the one clear entrance inside. I debated heavily about climbing over its gelid roof and into the open living space. There was a deep basement below and no one knew where I was, so I regretfully decided to remain outside. Inside the house the floor was covered with bits of the ceiling and a inch or two of snow. 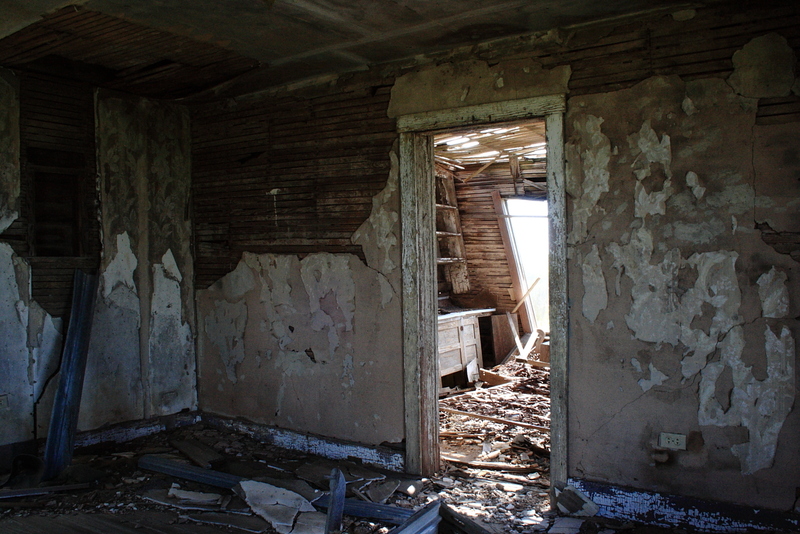 A few tattered bits of furniture remained behind. I felt that this house was once a jovial space. For the duration of my time spent there I was trying my hardest not to succumb to hypothermia. Several times I had to return to my car, which I left running on the side of the road so that it also would not freeze, to thaw my fingers out and warm up before venturing back out into the Artic. The wind chill was equal to what was experienced in Fargo in the dead of Winter. It felt like it was blowing through all the layers and straight into your bones. It was FREEZING!! Most of the photos taken on this infamously chilly day were pretty bad both technically and compositionally. I had little clue at the time to what I was doing, on what direction I was wanting to take this budding passion of mine and what my new camera was capable of doing. Everything, at the time, felt new and it was exciting. A few of the images taken then were okay and they are posted here now, but I know that if I happen back that way I will happily return to this little farmhouse and retake those images. If I am lucky the house will still be standing and maybe I can learn more about it. 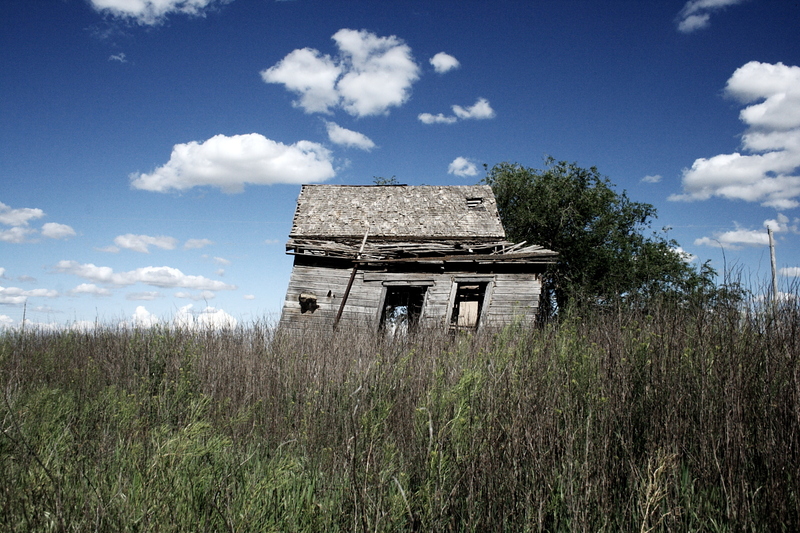 The Leaning House of Oklahoma, so cleverly named for its lopsided structure, is located in Oklahoma’s sparsely populated Panhandle, also known as “No Man’s Land”. I had passed by this quiet little house several times before finally noticing it. Once it did catch my attention I could not help but feel dumbfounded that the house had ever escaped my attention at all. 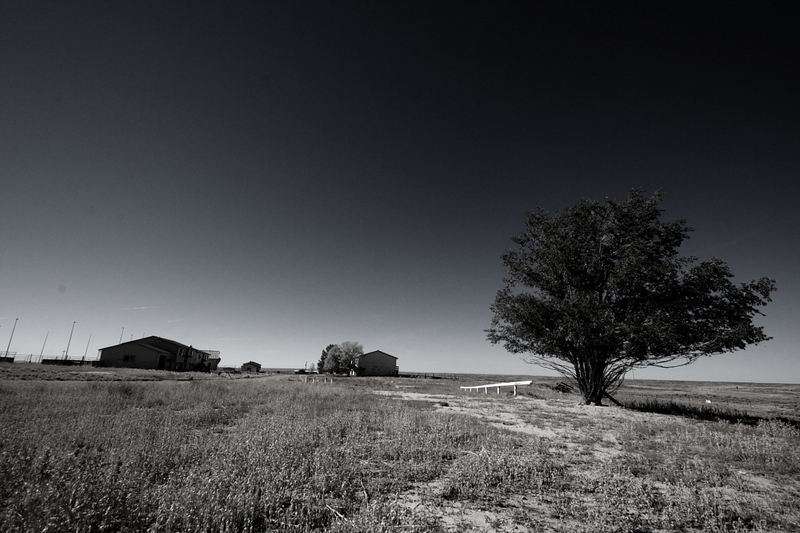 It is a small simple house of three rooms standing in solitude with a single towering tree against a vast grassy landscape. Nothing else seems to exist when one finds oneself situated on the side of the road in front this deserted space. In every direction I look there is only tall sun-bleached grass, or the highway stretching into more nothing. “No Man’s Land” is a very appropriate name for this region. The house itself is would be considered very petite by today’s standards. Looking at it I cannot imagine it being a home for a growing family, especially for a modern family of today. 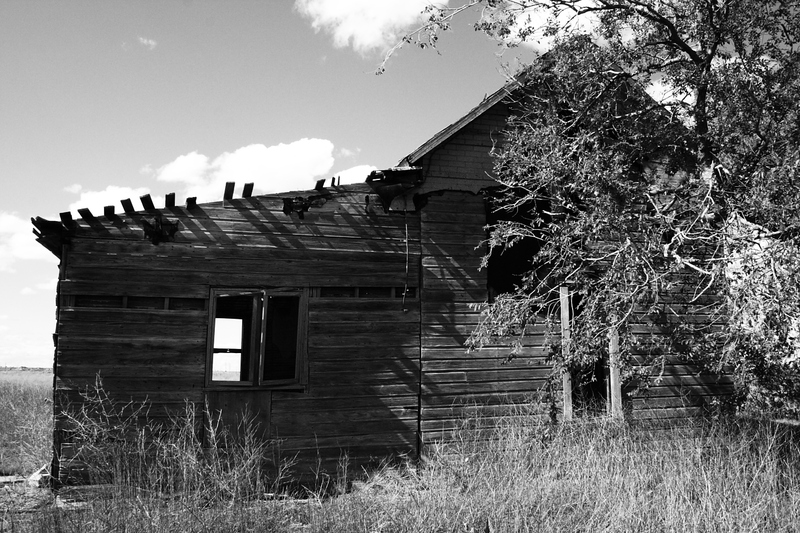 My first impression, based on the architectural simplicity, was that it once housed workers for a local ranch or business, but upon further inspection my impressions later changed. Stepping inside through the front door space, I immediately noticed the symmetry between the windows and doorways. If there is a window on the left wall then there was another window directly across on the right. The placement of each window frame perfectly matched the placement of another window on the opposite side. The front door was perfectly aligned with the door space between the two lower rooms and the backdoor. In the back was the kitchen with a small space blocked off, possibly for a bathroom. The roof had mostly collapsed and is now existing on the floor, which was in a similar state of deterioration. Beneath was no basement or crawlspace, just a couple of inches between my feet and the Earth. 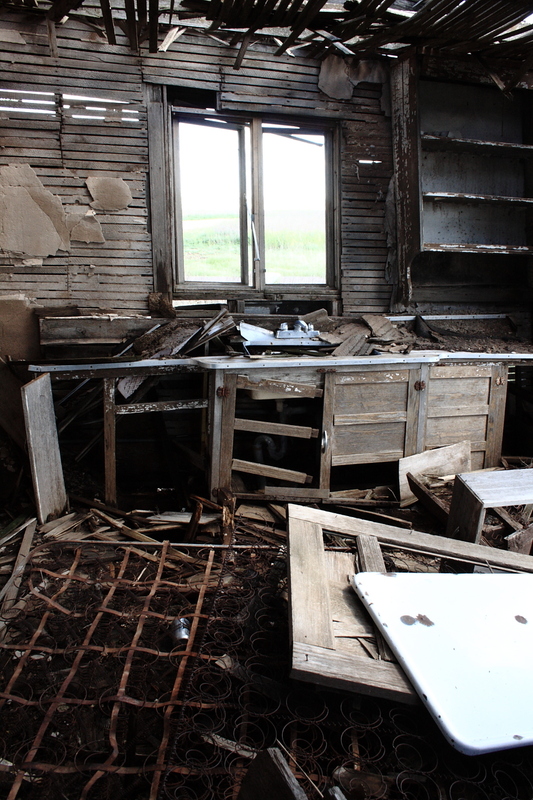 The kitchen sink was still there, along with some empty cabinets and the rusty skeleton of an old mattress. In the corner was what I believe to be the narrowest stairway I have ever seen leading up to a single bedroom. The extremely tight space would not allow a person with any amount of girth to comfortably fit. I am not a particularly large person, average in size, and I felt like I would get stuck if I took a few more steps up. My speculation is that this was probably built for a young couple starting their lives together shortly after WWII. There was only a single layer of wallpaper, this indicates to me the possibility that there may have been a single occupation and from the state of the house I suspect it wasn’t occupied for very long. 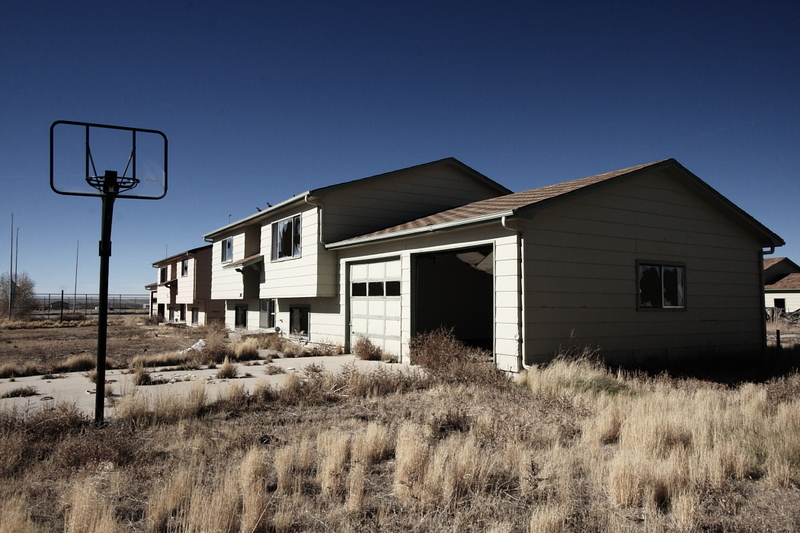 This house did not hold the same ghostly vibe that other abandoned houses have. It felt empty, like it had been empty a lot longer then it had ever been occupied. This area of Oklahoma was not an easy land to live off, hence the clever nickname “No Man’s Land” and it is possible that who ever originally lived here, like with many rural communities, left for larger communities. 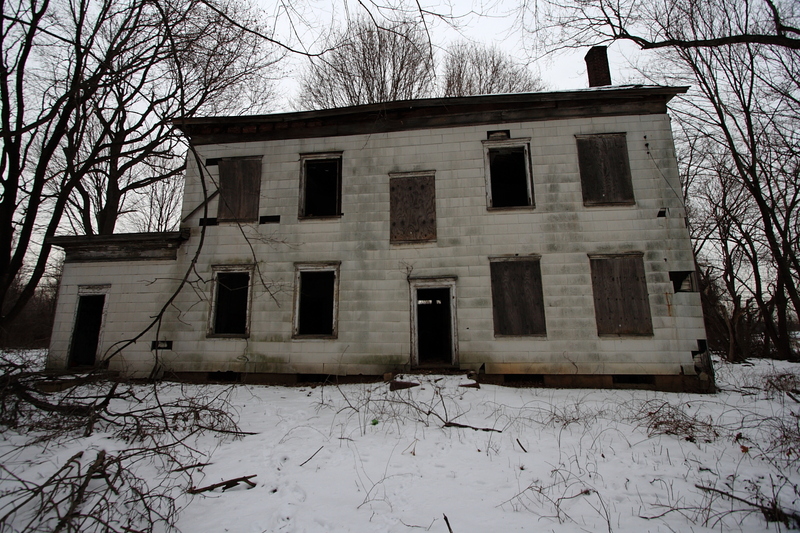 Thanks to my Mother’s keen eye, I came to learn of an abandoned house existing in Manalapan, New Jersey. I was so excited about this house that twice I explored it within a few short days to photograph it under different lighting. For the first visit I parked at a gas station across the street, sprinted across the four lane highway and staggered up a filthy snow bank onto the front yard. Despite the rush of traffic behind me, I could feel the heavy silence in front of me from this once majestic house. 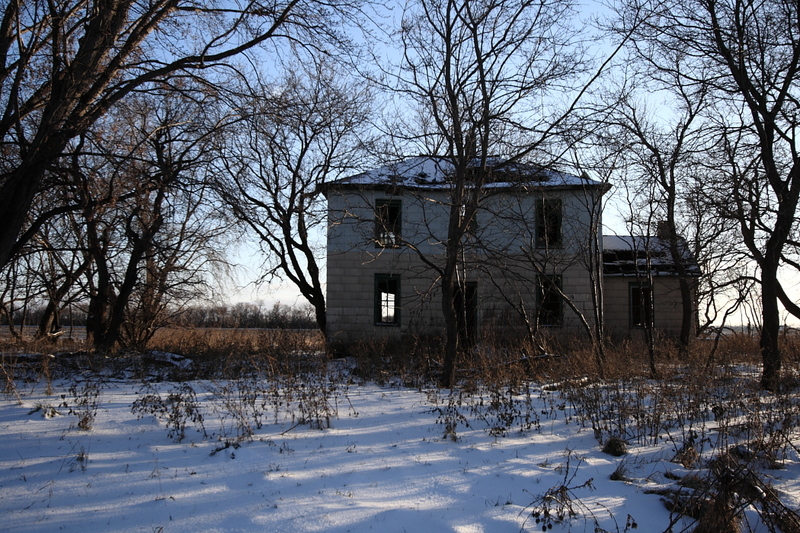 I advanced through snow and the young trees that had sprouted everywhere in hopes of filling up the open space in order to view this rather sophisticated two story farm house from various angles. The roof of a decaying and formerly grand wraparound porch is now, with the exception of a small section, resting on the ground, exposing a band of pumpkin colored brick sandwiched between layers of stale, aging white wooden panels. In the back were a few smaller brick buildings, also in a state of deterioration. One building was definitely a garage, but now looks to be a seasonal home for a transient individual, while the others look more like storage buildings typically seen and used on a farm. 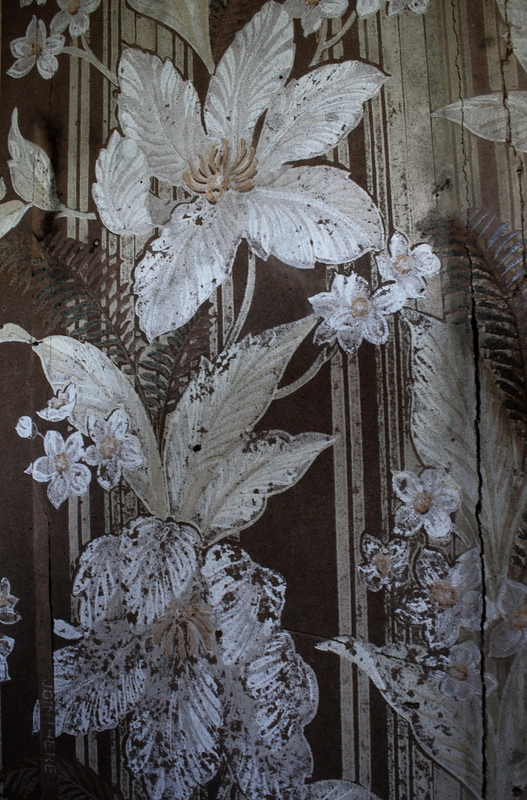 In the back of the house I found a couple of open doorways and gingerly stepped inside to find dated furniture along with wallpaper from the 1970′s. It looked as though the original occupants took what they valued and left everything that they didn’t want before boarding the windows up. Parts of toys, some old dishes, food jars and clothing were left scattered about. It was obvious that local kids and squatters have been here over tha years, but it was also obvious that they didn’t bring in all the rubbish that I was seeing. The floor was mostly hidden beneath the rubble and garbage. In the back of the house, with the windows and door spaces left open and exposed to years of harsh weather, were wooden floorboards rapidly rotting away. When looking in and down from one of those window spaces I could see items, such as articles of clothing and colorless plastic objects that I could not identify, from upstairs now lying on the basement floor. 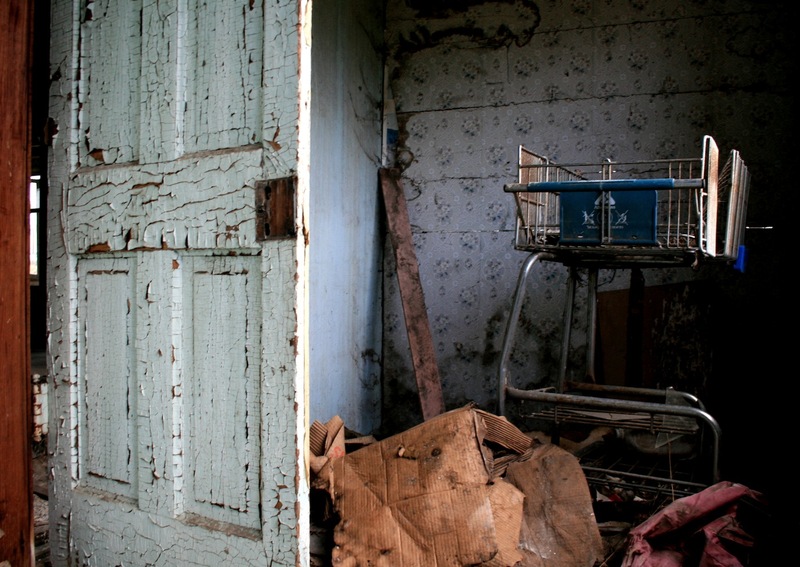 At the base of the stairway rested the plastic head of a dismembered doll within a handful of inches from one of these rotted holes, its dress positioned casually over the edge. In the front the floor was stronger and capable of holding my weight. Carefully, I walked across the first room, possibly a kitchen, and into the next. It wasn’t until my second visit that I had built up enough courage to walked even further inside the rooms, carefully avoiding the back rooms and positioning myself in the door frames to take my photographs. I figured that since door frames were considered safe places during earthquakes then the same logic would apply to a house that may decided to collapse from beneath me. It was a very nice house at one point and, knowing how NJ has been dividing and transforming what was once beautiful and vast farmland into overpriced and homogenous housing developments and stripmalls for the past 25 years, I am betting that the owners probably sold their property and retired elsewhere. Sadly it is a common story here in NJ. 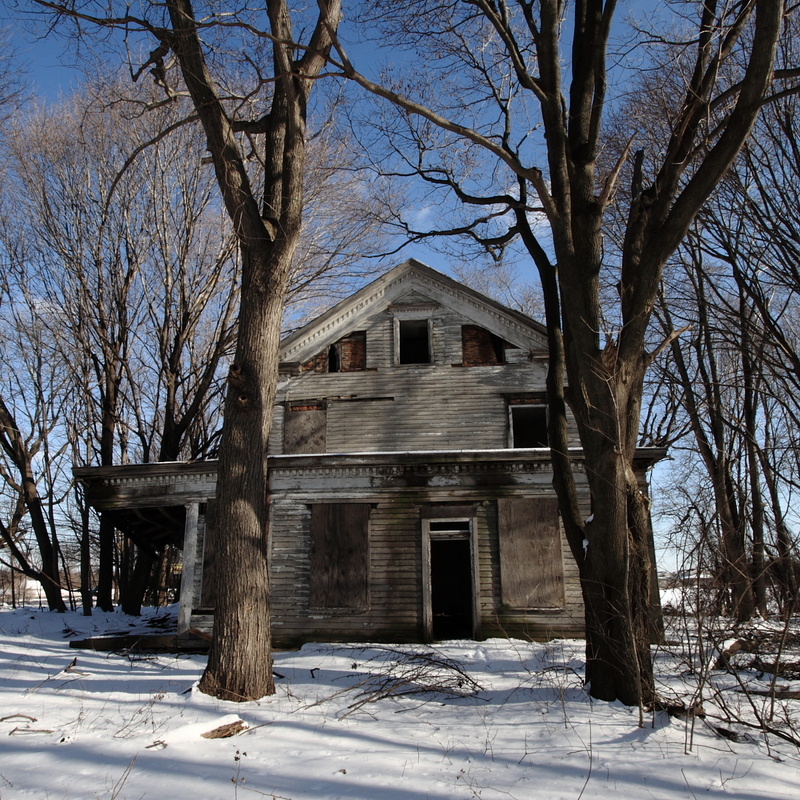 Many of the old farms in Central NJ are now gone and several of the ones that still exist are preserved only through state funding. I plan to do some research on the area and see if I can pull together a more solid story of what really happened, but I think my guess is pretty close to the truth. Judging from the state of deterioration, I’m guessing that the property was regrettably abandoned sometime in the last 10-15 years. This was obviously grand home that once belong to a secure and probably affluent family. The architectural details both inside and out are a bit more sophisticated than other farm houses I have entered. I wouldn’t describe it as flashy or expensive in design, but solid in form with some lovely decorative elements in the trimmings. 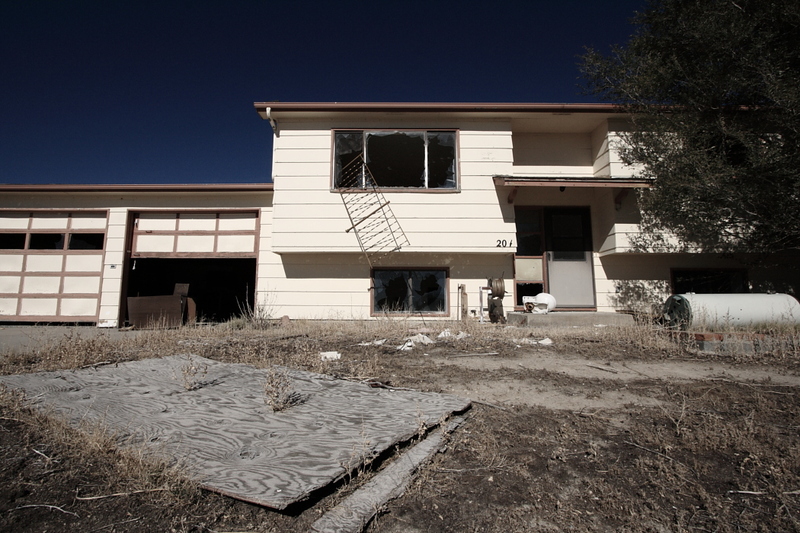 January 2012 Update: I’m sad to inform that this beautiful house has been demolished, most likely for new development. I came back with the hopes of taking some exterior shots without the snow and maybe try to retake some of the interior shots from different angles, but there was nothing left of the property except for the trunks of a few trees. I not completely shocked that the house was gone – the floors were dangerous to walk on – but I was still hoping for more time with this one. Table Rock has been in my thoughts for several months now. The last time I visited I had only a mere 20 minutes to walk through the empty village and photograph the first images that caught my attention! 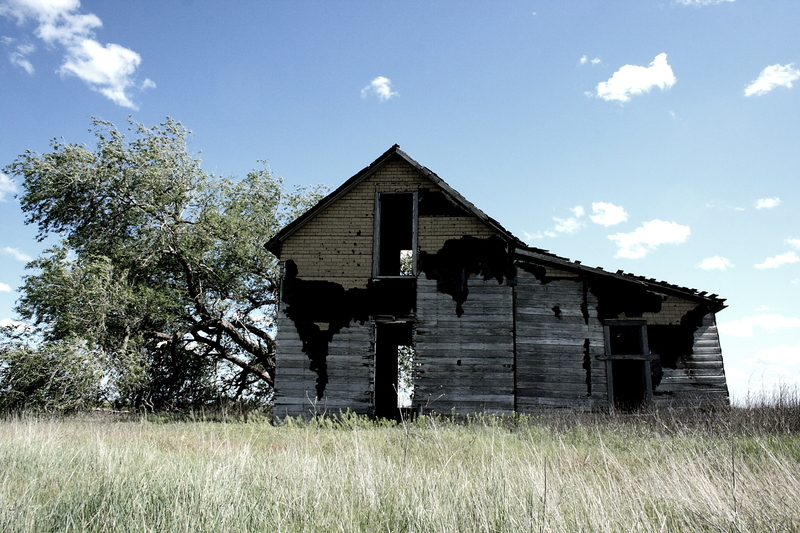 I had promised myself, like always, that I would return to this little forgotten community of rural decay to further explore it with my camera. So here I am, again. I parked Simone, my trusty ford, at an abandoned nearby gas station about 1/2 mile away. There were signs all over the place stating “No Trespassing” and I really don’t know if the company still sends people to check on the area or not. Plus there wasn’t anything to provide proper cover for Simone. The entire development is easily viewed from the Interstate and I was aiming to be a little more stealthy than I have been in the past. The plan was to focus more on details that I had missed during my previous visit and to venture inside a couple of the houses. I didn’t enter any of them last time due to the time restraints. Once inside the development I made the decision to again NOT go inside. With more time on my hands to really take in the details of my surroundings I can see all the evidence of squatters. First I look into the ground floor windows of the “big house” at the entrance of the housing development and saw several sleeping bags and other personal objects laying about. Later, in other houses, I found unbroken windows with blankets hung up to keep light out, and more personal objects suggesting that there were a group of people possibly still squatting. Out of respect for their privacy and personal space, I decided to remain outside. My thoughts were that these people don’t know me or what my intentions are and I don’t wish to put them into a situation where they may feel that they have to react defensively. Interestingly the last time I was here I recalled having an intense feeling that I was being watched by a few of the houses. Perhaps I actually was… I never did see anyone while I was there, only their belongings. – Later on I learned that there has been a large problem not just with squatters in the village but also people illegally using the space for Meth Labs. 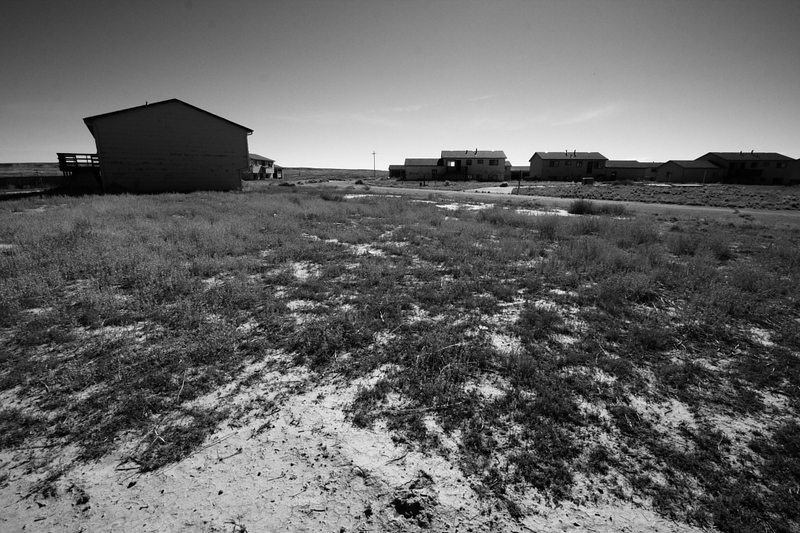 The isolation and desert landscape makes this empty community of houses a target for some illicit activity. Knowing this makes me feel grateful that I had followed my instincts and remained outside, despite my curiosity. From what I had seen through the windows it looked rather cozy inside. The carpet was still plush looking and some rooms still had their walls fully intact. 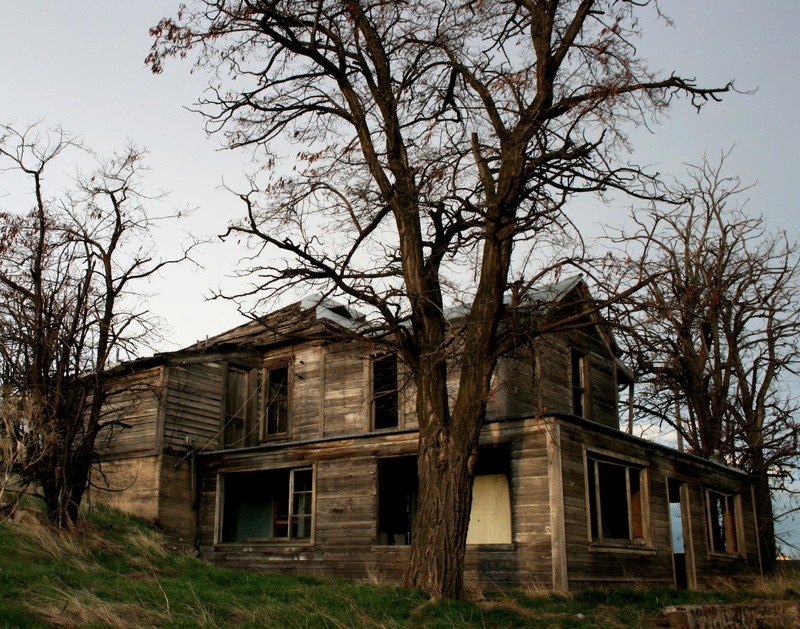 Several of the houses looked as though they had been thoroughly gutted and terribly abused. While other houses appeared to have been spared some of the same cruel treatment. Perhaps because these houses were the houses people choose to dwell inside? I took my time walking around the neighborhood, poking my head behind houses and over fences. Looking for clues of what life was like before everyone left. Keeping an eye out for any sort of security, there was a brief moment when I thought for sure someone was driving toward the village to find me but it was a blessed false alarm. my guess is that the residents left maybe around ten years ago and it looks like there was at one point several other houses that no longer exist. There were a few cement foundations left in the center along with open lots and small fences. The solitude and stillness of Table Rock Road was intense! Near the end of my visit I found myself stopping and sitting in the middle of the road itself listening to the din of the birds and sharp buzz of a few insects. The sun was warming and a gentle breeze was calming. I could have spend hours there relaxing and meditating at the spot. 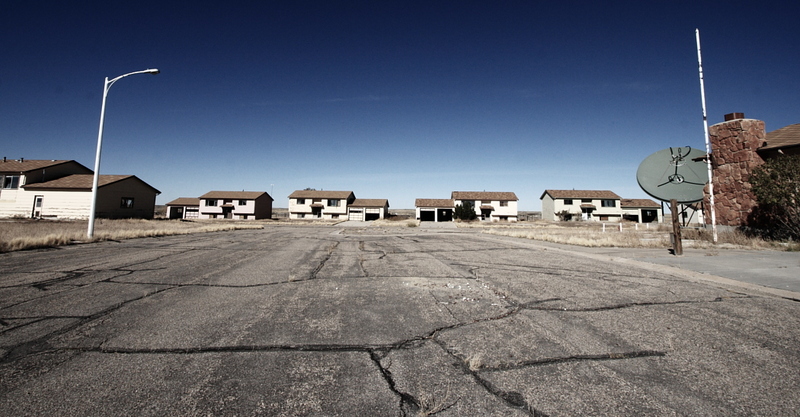 Galchutt, its a small town located just off the Interstate and with no services available for those traveling through the area. 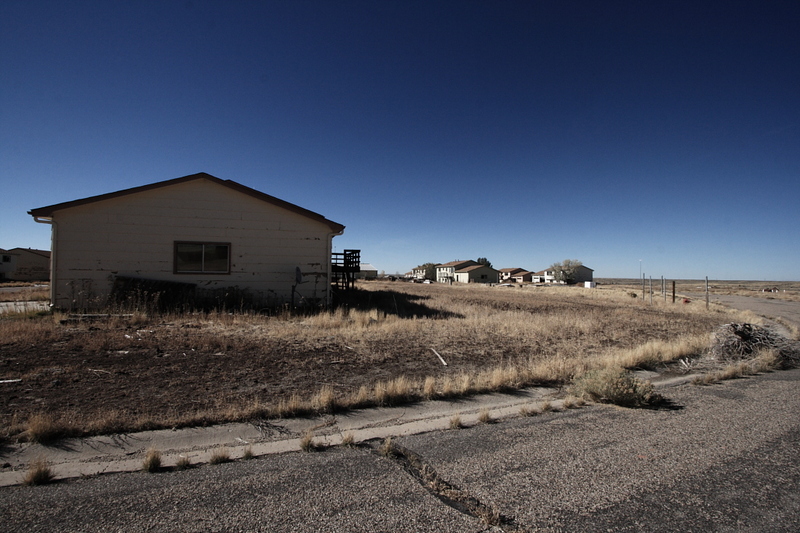 All that exists in this little spec of a town are a few sporadic houses and a lone church. You would easily pass it by without realizing that it even existed. 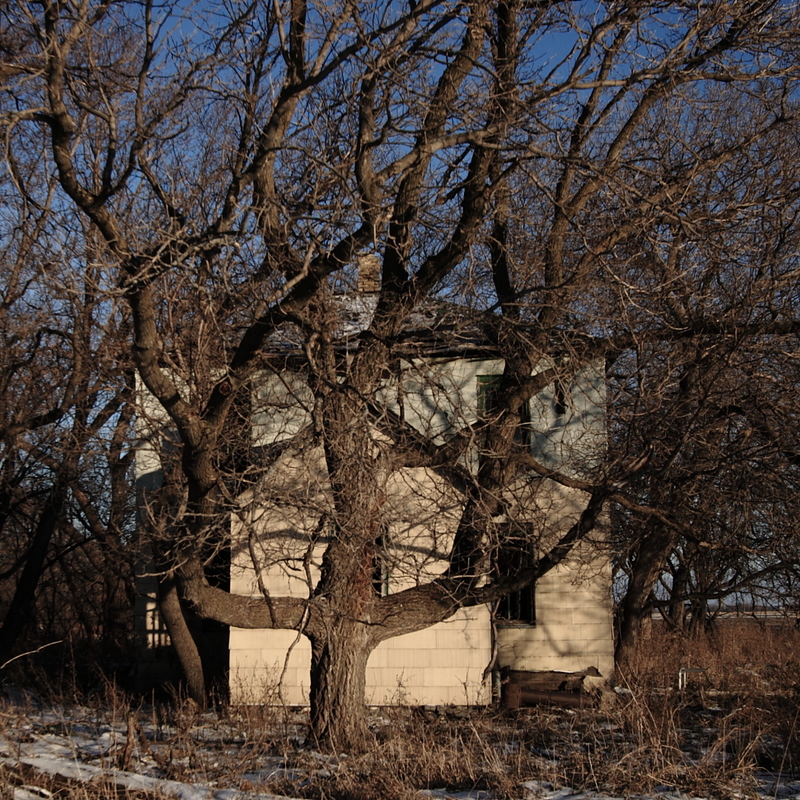 From the Interstate highway I had noticed this old two-story house snuggled comfortably within a thicket of tangled trees. I have driven on this particular stretch of Interstate a thousand plus times over the past few years and never once did I noticed this house before. Possibly it was overlooked because of the trees in conjunction with the visual distraction of an overpass in close proximity. Regardless of the whys, it is better now than never..
Its early December when I find the Galchutt House and the sun sets around 5:20ish these days. I manage to arrive just before 4PM when the sun is low and casting a strong warm glow on everything. The house is located at the end of a barely used farm road. Most of it is covered in snow. I couldn’t drive all the way up to the house so I parked in the middle where the road was somewhat clear of the snow and then quickly walked the rest of the way. It was cold. The house looks like it has been empty for a very long time, possibly even since the 1980’s or earlier. Because I didn’t enter the house I’m not sure exactly what it was that I saw inside, but there was what looked like an old heater in the style that echoed the 1940’s or 19 50’s. There wasn’t much else inside the house besides the building materials lying in piles. The second floor was swiss cheese. Several boards were missing, giving a clear view outside the front upper level window from the back lower level window.. Looking inside through one of the glassless windows I saw that there was no basement to dangerously fall into, only a shallow floor space beneath the boards. The real danger would have been the house itself collapsing above me. Looking inside through the windows I could see how the building was concaving inward at the house center. It was literally falling apart at the seams like a poorly stitched jacket, but from the outside the house looked eerily peaceful. Walls were tearing apart at the corners, the effect of which provided an ‘Alice in Wonderland‘ like perspective. The day was beautiful and the air was extremely chilly. After about 20 minutes I could barely feel my fingers and after 20 more I could hardly bend them to take photos. I figured that that would probably be a good time to leave. The sun was getting closer to the horizon and now that I know about this house I can come back for more Interior shots.. Maybe even getting a closer look at the heater. This old beauty was located somewhere along Interstate 80 in Eastern Oregon. The house looks like it was once a beautiful and well loved farm house nestled comfortably into the side of a low hill. Its a large building with a strong presence, but not excessively large or flashy in design. The interior had a simple layout with a large wrap around inclosed porch area. Across the street exists a brand new truck stop that I am guessing was once the farm itself. When I first saw the house the sun had already gone down, it was far too late for to take clear and decent photos. A few days later I had return just as the sun was close to disappearing past the horizon. Fortunately for me there was still enough natural light to carefully explore the building and take a few decent photos. Not as many as I had hoped for, but a few indeed. 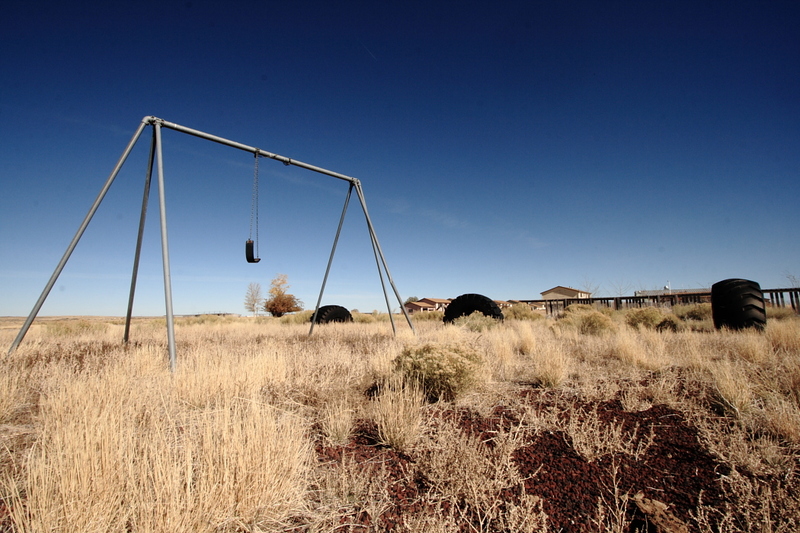 There was evidence of local kids and homeless squatters making some use of the place. 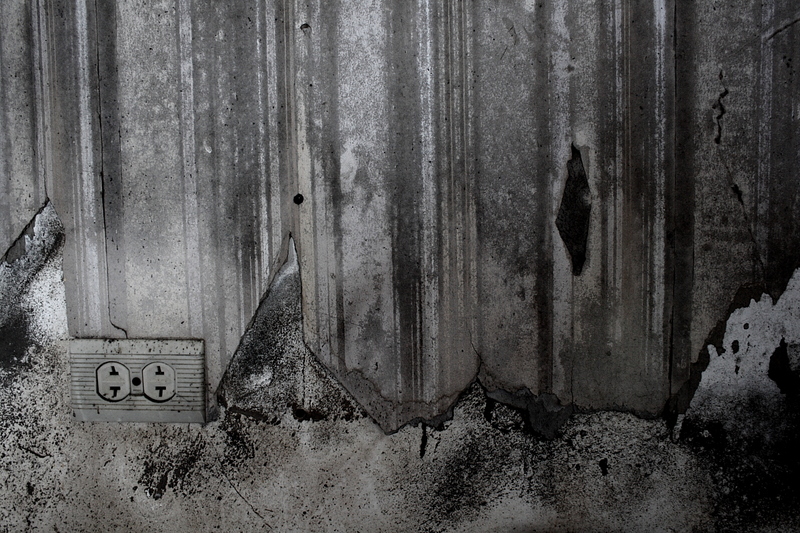 Graffiti adorned the walls and the floor was hidden under a thick layer of rubbish. Many shoes and old papers left about along with remnants of a mattress. It was easy to walk inside. 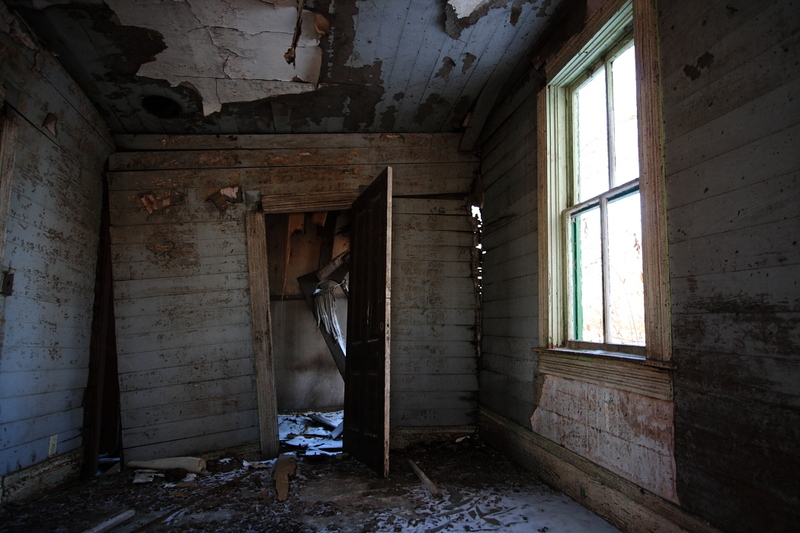 Doors and windows were left wide open. 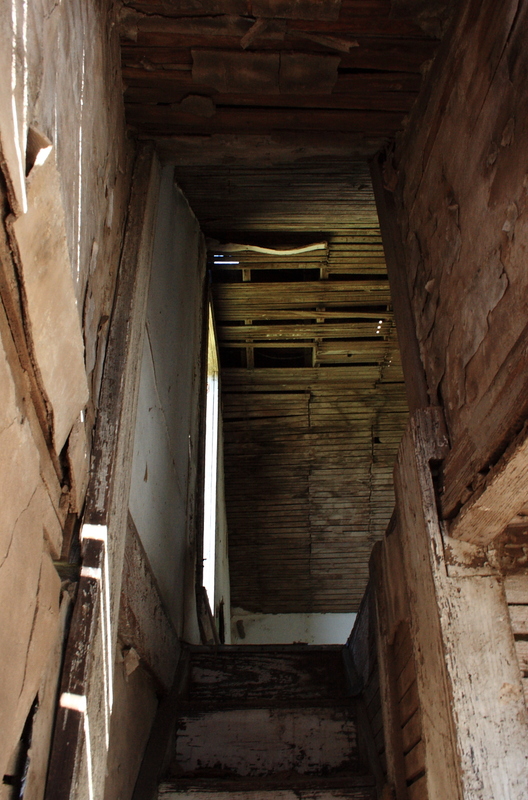 I didn’t venture upstairs as the stairs was mostly rotted away. I did manage a peek into the upper level by walking up the hill, but by that time the sun was past the horizon and I wasn’t able to get the photograph.